Hyundai has scheduled February 20, 2018 as the debut date for the 2019 Veloster hatch reveal. It’s unsure whether the new hatchback will be uncovered in South Korea at the 2018 Winter Olympics or NAIAS in Detroit. It will stay quirky with 3 doors and unconventional styling that sets this fun model apart. The Hyundai Motor Group along with sister company Kia, is developing new models like the all-new 2019 Stinger to create a new image for the South Korean automaker. The new Veloster should set the Hyundai brand apart. Car and Driver says the new Veloster will sit on a longer version of Hyundai’s current platform that’s already being used by the Elantra sedan. A pair of 1.4-liter and 1.6-liter turbocharged engines and a non-turbo engine are expected to be included in the hatchback, and they’ll be mated to a seven-speed dual-clutch transmission. The big news about Veloster could be a new N model from their high-performance division. This is rumored and not confirmed by Hyundai. The hot hatch Veloster N would compete with the new Honda Civic Type R, Civic Si, Subaru WRX STI and Volkswagen GTI. It’s been seen testing in Europe and there’s rumors it will launch in the first half of 2019. It's believed the new 2019 Hyundai Veloster will debut at the NAIAS Detroit Auto Show in just a couple weeks. But there’s also talk it could make its world debut at the 2018 Winter Olympics taking place in Pyeongchang, South Korea from February 9-25, 2018. We do know from the video below, it will make its global reveal on February 20 which will be smack in the middle of the North American International Auto Show in Detroit running January 13-28, 2018. 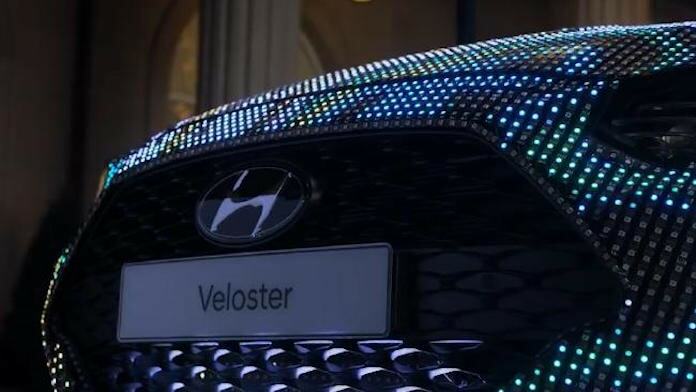 Check out the 2019 Hyundai Veloster video below for a 20 second LED light show of the new hatchback. We like to hear from our readers, so leave your comments below. If you liked this article share it with friends and tweet it out to your followers!